We are kindly inviting you to the ecumenical service of the word for the donors of the bodies for students of anatomy. Requiem will be celebrated in the Institute of Anatomy on May 23, 2019 at 5.00 pm. 29th concert of the series Faculty in heart of Charles. On 21 November – 3 December 2018, doctors from the Department of Otolaryngology and Head and Neck Surgery of the 1st Faculty of Medicine of the Charles University and the Motol University Hospital took part in a mission organised within the MEDEVAC healthcare and humanitarian programme. They stayed at the Thies Regional Hospital in Senegal. This was already a third such mission they have undertaken, whereby the first two took place in the spring and autumn of 2017. 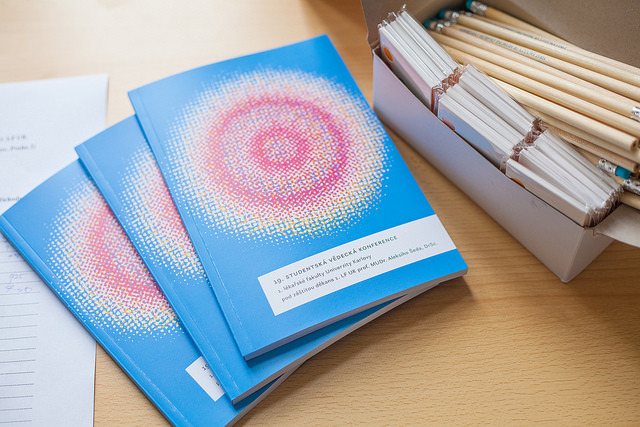 Scientia Foundation awards prizes for best scientific publications by students of the 1st Faculty of Medicine of the Charles University which were published in 2018. We would like to invite you to our event, „Jednicka na startu“. It will take place on Friday 5 October 2018 at the Apolinar Obstetrics & Gynaecology Clinic from 1PM to 6PM. Although this is a traditional event to celebrate the beginning of the new academic year, this year it has an entirely new concept. It is going to be an amazing afternoon with a very interesting program and many activities (music, refreshments, student associations, ...). Furthermore, come and join us for the launch of the new Charity Calendar and Diary 2019 . The Charity Calendar is the project of 1. LF associations. All proceeds will be donated for a good cause, to support the Život 90'. 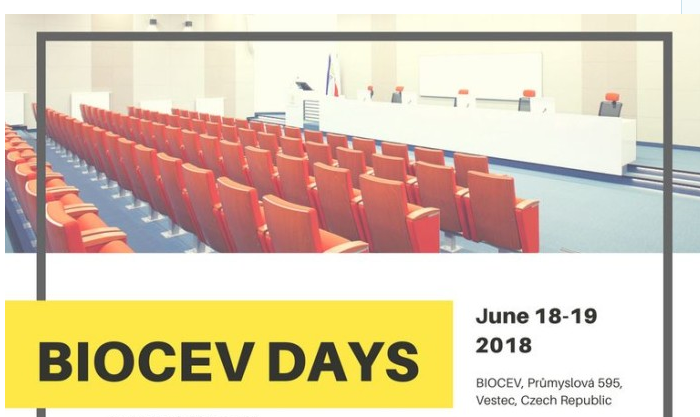 We would like to invite you to the Annual scientific conference "BIOCEV DAYS 2018" that will be held on Mon-Tue, June 18-19, 2017. All BIOCEV teams' members are welcome to participate. Registration is open at https://goo.gl/forms/lCSczmTnSAeNxZ8w1. If you have any questions, kindly contact Mr Petr Solil, petr.solil@img.cas.cz. We look forward to meeting you. 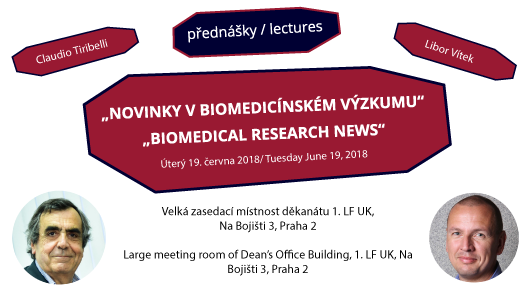 We invite you to Lectures of international experts in biomedicine "Biomedical Research News". When? Tuesday, July 19, 2018. Where? Large meeting room of Dean’s Office Building, 1. LF UK, Na Bojišti 3, Praha 2. The Student Scientific Conference took place on May 17th. Thank you for your participation! The one-week summer course on Advances in Selected Areas of Biomedicine for Students of Medical Faculties will be held in July 9-13, 2018. The course will focus on acquiring new knowledge and practical experience with biomedical research. 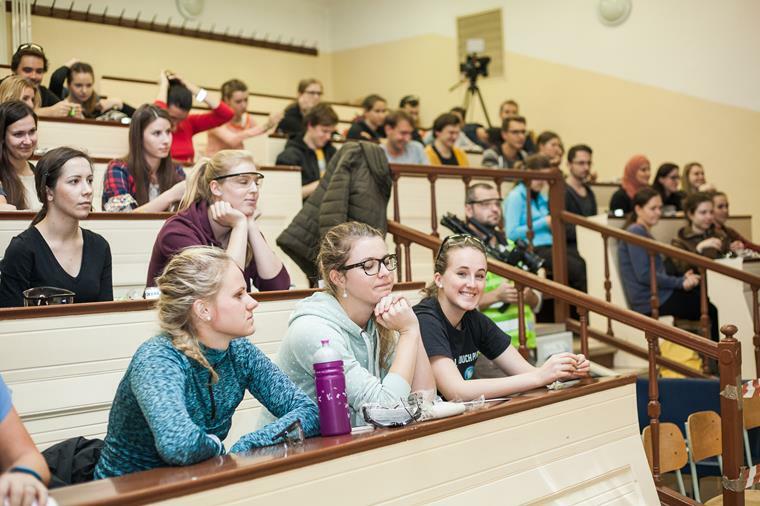 The aim is to increase the qualification of graduates of medical faculties of the Charles University in Prague in the field of biomedical research and to increase their interest in postgraduate education. 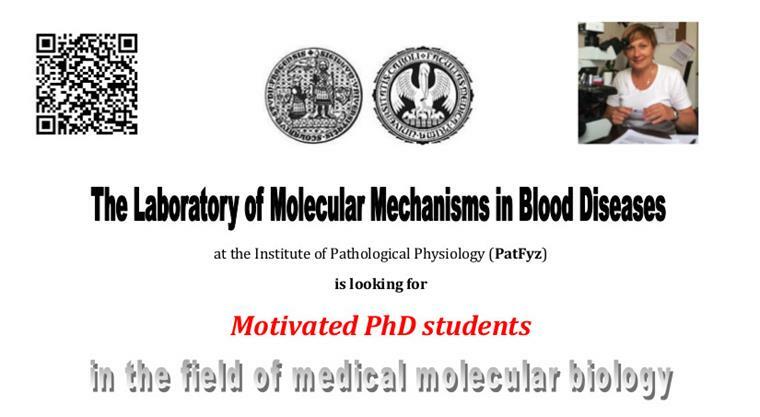 Institute of Pathological Physiology (PatFyz) is looking for Motivated PhD students. Lab at a glance: Our research activity is focused on the understanding of molecular mechanisms in human B-cell leukemia. 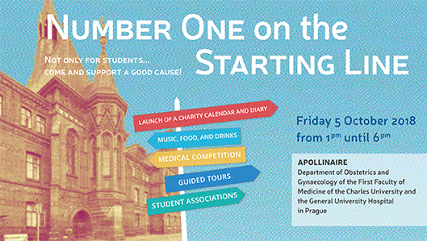 Alumni Club was established at the First Faculty of Medicine of Charles University in autumn 2015 under the auspices of the Dean – Professor Aleksi Šedo. Its aim is to maintain the link between The Faculty and its graduates after graduation. We would like to offer you the option of class reunions, professionally specialized lectures, club benefits, discounts and much more.